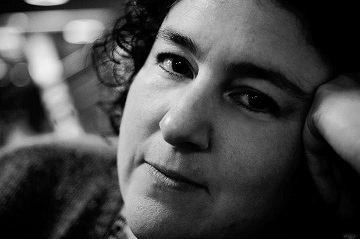 Jill Abram reads, writes, performs, presents, listens to and organises poetry. She is the Director of Malika’s Poetry Kitchen, an influential collective which encourages craft, community and development. Jill grew up in Manchester, travelled the world and now lives in Brixton. She performs her poems regularly in London and occasionally beyond, including Ledbury Poetry Festival, in USA and Paris. She has curated and hosted many events and created the Stablemates reading series. Publications include Magma, The Rialto, Under the Radar, And Other Poems and Neu! Boots Are Made For Walking. She won the inaugural Poetry Pulse competition and the Elmbridge Literary Competition 2016, is the Wham Bam Poetry Slam Champion and runner up in the StAnza slam 2017.